Macroalgae stranding events are becoming more common. During the past decade, the number of macroalgal beach stranding events has increased, with the number of stranding events following freshwater discharges increasing since 2009. 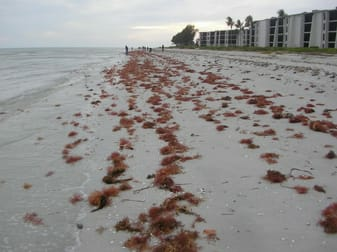 A two year study of macroalgal community dynamics from 2008-2010 revealed that there were at least 2 major sources of macroalgae stranded on the beaches of Southwest Florida. The extensive hard bottom habitats host a diverse collection of mollusks, invertebrates, grouper, and snapper. These areas also have a small amount of macroalgae that is normally grazed by urchins and fish. It is a diverse assemblage with 15-20 dominant species. Large waves associated with cold fronts dislodge the macroalgae and they drift and are stranded on the beaches. The hard bottom areas are poorly mapped and not well understood. SCCF Marine Lab has re-initiated quantitative sampling of macroalgae at key locations including Bunche Beach, Gulf of Mexico sites in 15 m depth. With some support from the City of Sanibel and Lee County, we were able to characterize the nutrient and salinity associated with the large freshwater releases in 2013. The Marine Lab has also been collecting and identifying macroalgae stranded on Sanibel beaches when necessary since 2009. Cruises in August and November 2013 initiated by SCCF demonstrated high TN and TP as far as 10 miles offshore of the Sanibel lighthouse. The funds for the analysis were provided by the City of Sanibel. A contour map from the August 2013 cruise is shown in. TN concentrations (macroalgae thought to be N-limited in SW Florida, Brand 2010) were much higher than the 95 percentile for all Florida samples in the nearshore. There were many beach stranding events, but there were 2 events with exceptionally high macroalgae that occurred in October 2013 and January 2014. These events had a high diversity with 4-5 abundant species and a total of 10-12 species. The dominant species in October were Agardhiella subtulata and Solieria filiformis. Solieria is a opportunistic species that will attach to other algae and grow quickly with high TN. Agardhiella is more slow growing, but will still increase its growth under high nutrient conditions. These species were found in the November 2013 surveys as the dominant species at GOM12. The dominant species in January 2014 was Chondria capillaris and Eucheuma isifirme. These species were common previously in samples, but more sampling offshore is needed to confirm that they are growing abundantly on hardbottom areas.